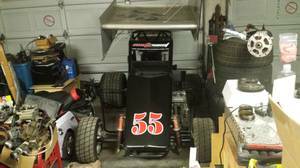 The nitro-methanol powered Mini Sprint Track Racer for Sale comes with two spoilers, a track timer, brand-new tires and battery. The mini sprint comes with an additional front axle for width preference and two extra tires. This machine is ready for racing at the track or for riding off road!
. And then bring your cash if you want to buy! The Mini Sprint Track Racer for Sale is located in Kingman AZ Arizona and I'm asking $3500 for it in CASH ONLY. Here are a couple of Mini Sprint Cars for sale and a 636 MINI SPRINT for TRADE if you're interested. Email using the comments form provided by GoGoCycles Used Motorcycle Classifieds if you have questions about the MiniSprint or any of its features.